I was on the patio putting my seedlings to bed for the night when I heard a commotion in the woods. I secured the dogs then wandered to where I'd heard the sound. It had been a heavy thump with some thrashing about of leaves followed by silence.. Then I noticed five very large birds circling very low by our outbuilding. One or more must've attacked something. I was so glad I had made our Chihuahua Paquita take cover. I'd read just yesterday about how Bald Eagles, which can be spotted all over these parts, can carry about 4 pounds. That doesn't mean they wouldn't try to lift her up and drop her from a height that could kill her. As I marveled at their cunning hunting skills and how low they were flying, this feather floated down to earth. The calamus (the hollow shaft of the feather that attaches it to the bird's skin), was still wet with a little bit of flesh around it as though it had been ripped out from the bird's body. Creepy! Weird! COOL! It measured 18 inches long (!!!) and is almost perfect. As much as I love my little parakeet Dinah, her feathers aren't nearly this fascinating. The dogs sniffed at it for a full five minutes, but if it moved, they jumped back as if they'd touched an electric wire. I cut off the very tip of the calamus, shoved the inkwell from a pen inside it and dabbed it with a little hot glue. Voila! I've got a quill! 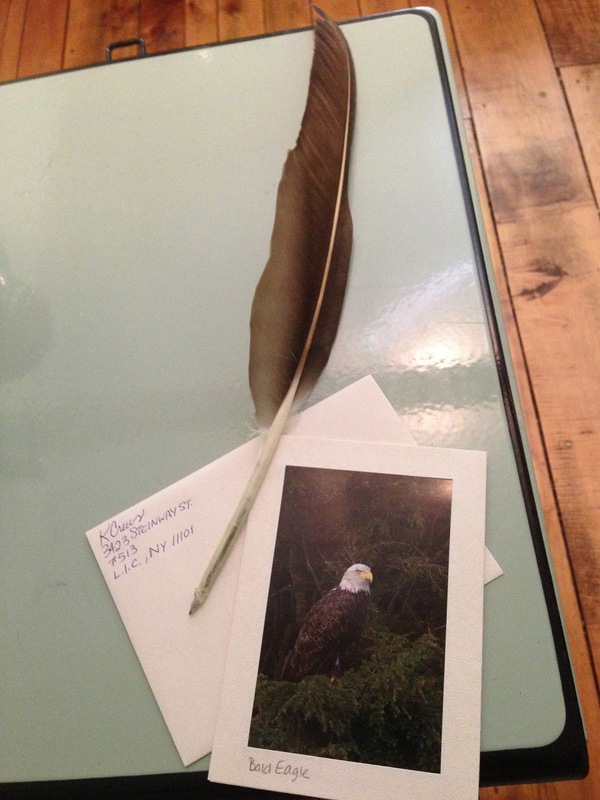 I used it to write Dad's Father's Day card which happened to be a photo of a bald eagle. How serendipitous!